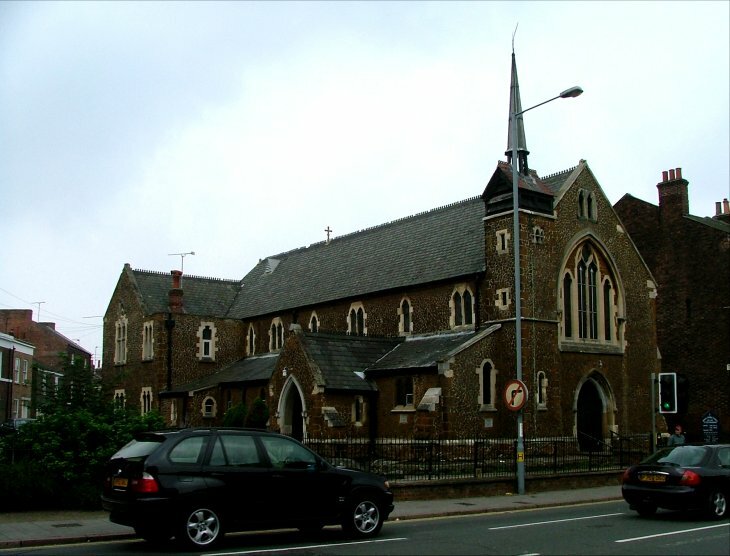 Kings Lynn is a fascinating town, with a couple of Norfolk's finest churches at its heart; but the Catholic parish church of the Annunciation is away from all that, a quiet little 1890s building set apart from the town centre, on the busy road to London. Indeed, this area is so urban and so battered that it might even be in London; some back street in Peckham or Tottenham perhaps. The Annunciation, with its jaunty spirelet, gives the street some much needed character. Its rough carstone walls give it a sense of the exotic, to my East Anglian eyes. A relatively undistinguished building, then. But the Church of the Annunciation has a great significance for English Catholics, out of all proportion to its architectural importance. For here it was that, 360 years after the Reformation that destroyed it, the Shrine of Our Lady of Walsingham was re-established, and Marian pilgrimage brought back to England. The original building on this site was much smaller, by Augustus Pugin no less; it was the 1845 commission of Father John Dalton, Lynn's Priest at the time of the lifting of the penal laws. 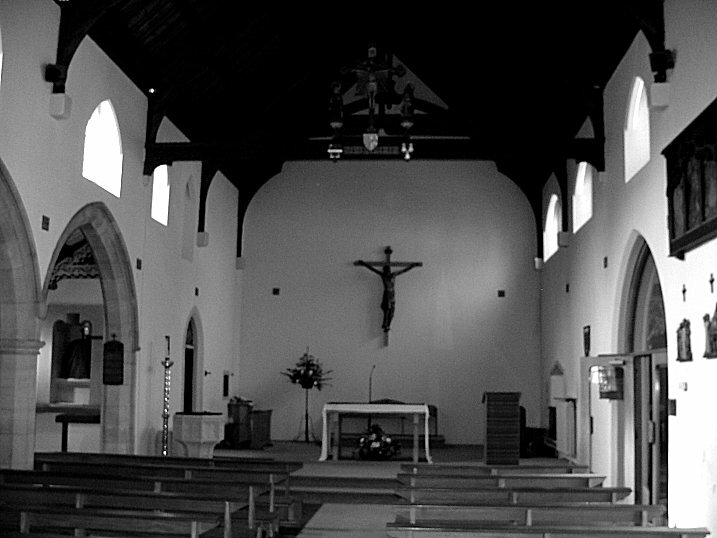 There was not a huge congregation; the parish, which covered the whole of north west Norfolk, had, according to the Lynn Advertiser of the time, less than 150 Catholics all told, and all of them poor. 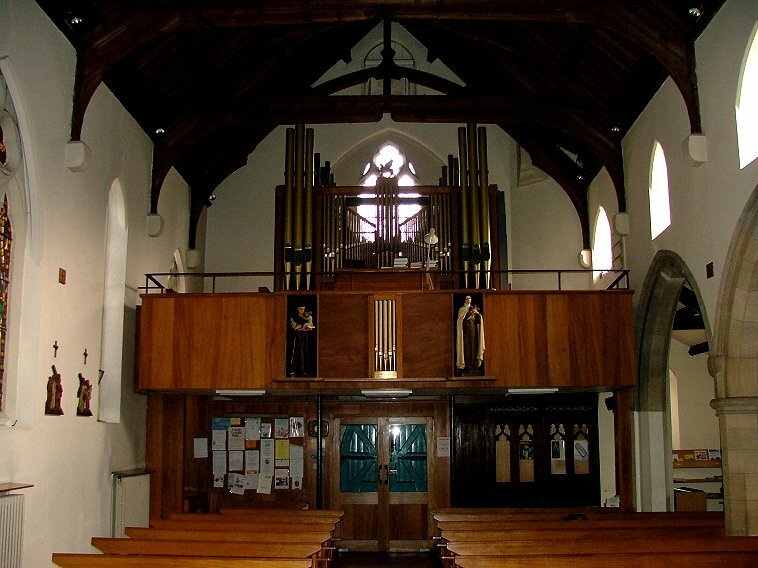 However, the future of this parish and its church would be dramatically shaped by two small villages that lay within it. One of them was Walsingham; the other, Sandringham. In the later years of the 19th century, the Prince of Wales, later to become Edward the VII, bought the vast Sandringham estate, and built his dream home on it. It became his favourite residence, both before and after he was crowned King. It was where he entertained his guests. Being a great cosmopolitan, many of his guests were foreign; and, of course, this meant that most of them were Catholics. 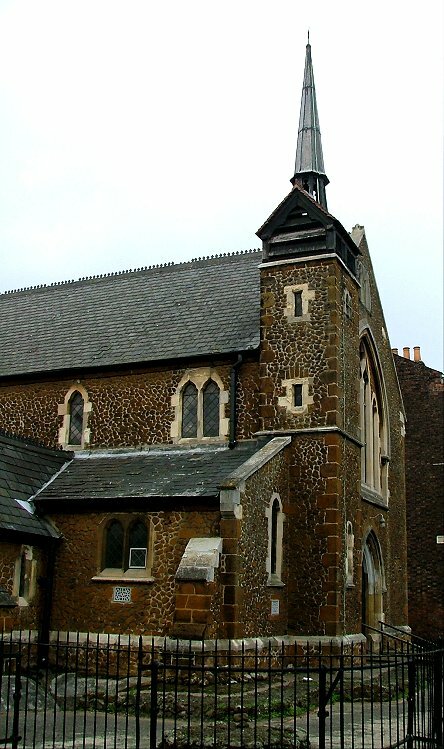 To attend Mass, they had to come here, to Kings Lynn; but the condition of the little 1845 church gave great discomfort, and cause for concern. 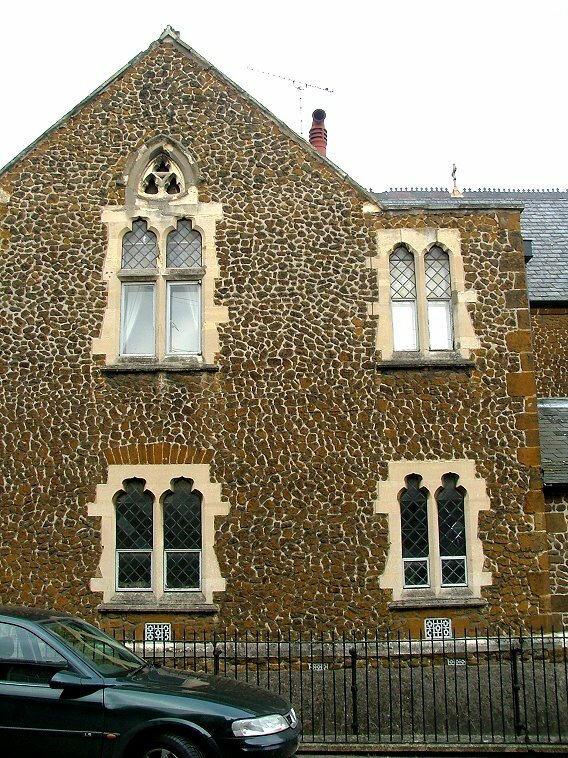 The Prince, who was a great benefactor to medieval churches in this part of Norfolk, got together in 1888 with Parish Priest Father George Wrigglesworth to discuss ways of improving the facilities. The Prince of Wales paid for a full survey of the church - and it was found to be falling down. As with so many buildings in this part of Norfolk, the foundations were adrift in the soft, marshy ground. It became imperative that a new church be built, and the Prince contributed fifty guineas (about ten thousand pounds in today's money) to start funds rolling. 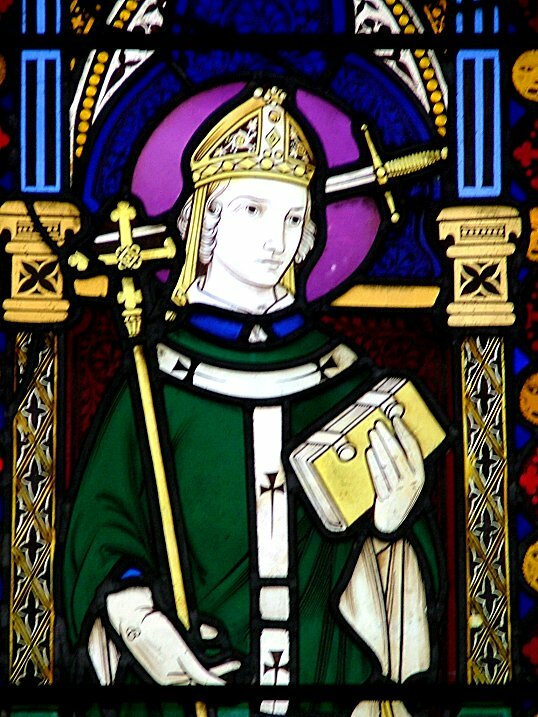 But this was a poor parish, and in the end the Diocese of Northampton had to step in, partly out of embarrassment perhaps, and the building of a new church got underway. It was completed in February 1897, the work of the architect Walter Lynn. George Wrigglesworth was a great antiquarian, and he seized the opportunity to enhance the building with something that was dear to his heart. In medieval times, England's greatest site of pilgrimage was at Walsingham Abbey, some 20 miles away, and in the Annunciation parish. 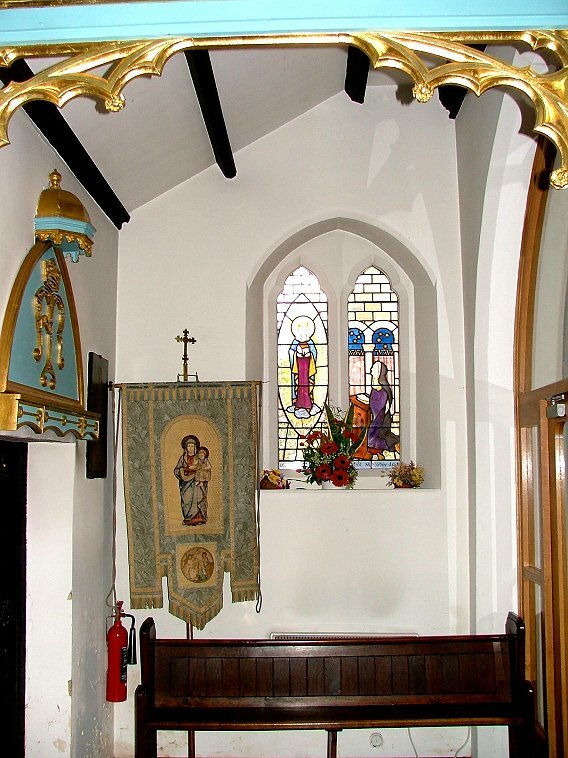 Many pilgrims came ashore at Lynn, and the Red Mount chapel, where they would hear their first Norfolk Mass before setting off on the remainder of their journey, still survives. The shrine had been destroyed by the Anglicans in 1536, and Walsingham had fallen back into the doldrums. But in its heyday, its streets had been alive and full of colour with processions, celebrations, hostelries and souvenir shops. Could something of that devotional life be brought back to the streets of 19th century Lynn? The little chapel forms a small aisle to the south of the sanctuary - it is tiny, little more than a vaulted tunnel. 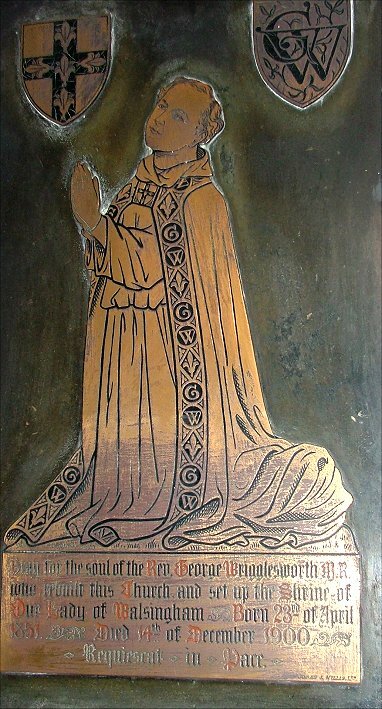 Wrigglesworth bought a statue of the Blessed Virgin and child from Oberammagau, and on its arrival at Kings Lynn railway station it was met with great ceremony and rejoicing. Hundreds of people carried it around the Red Mount chapel and then to the church of the Annunciation, where it was enthroned. Fifteen lamps were lit to burn in front of it, one for each mystery of the rosary. 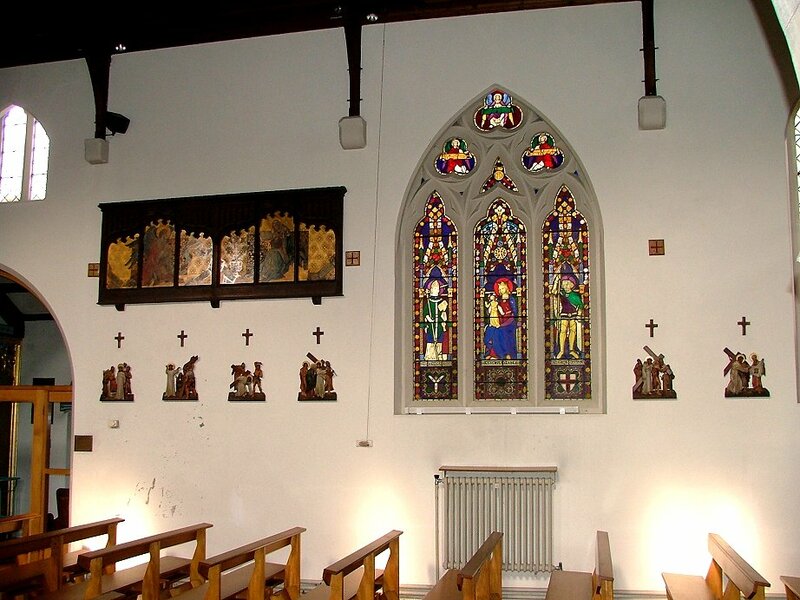 The chapel was enclosed with a little wooden screen in the 15th century style. The procession became an annual event, and seems to have become a part of the life of this lovely, welcoming town. Coincidentally at this time, Charlotte Boyd, a parishioner and convert from Anglicanism, found herself in a position to buy the so-called Slipper Chapel, a small medieval building at Houghton St Giles on the outskirts of Walsingham. This chapel had been the last of the staging posts on the journey from Lynn to Walsingham in medieval times. Since the Reformation, it had been used as a barn, but she restored it as a place of Catholic worship in the care of Downside Abbey. Soon, pilgrimages from Lynn to Houghton and back were taking place. The church of the Annunciation at Kings Lynn became a site of pilgrimage for Catholics from all over England. And so it might have remained, if it had not been for an Anglican clergyman, Alfred Hope-Patten. 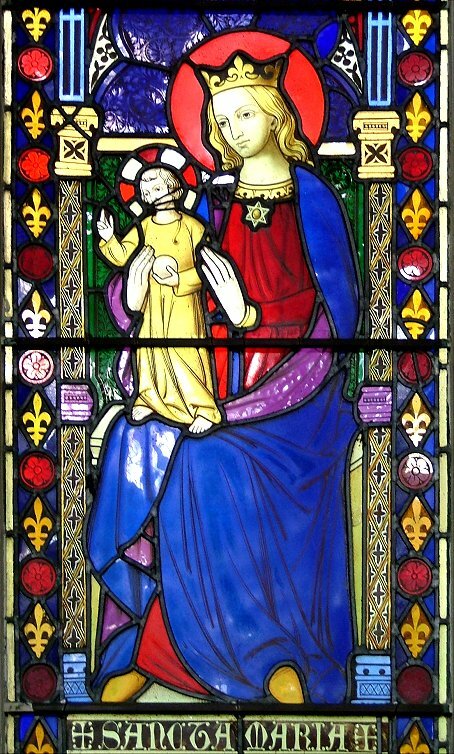 In the 1920s, he established, to the outrage of much of the church of England, a Marian shrine in the Anglican parish church at Little Walsingham. By 1931, he had raised funds to build an Anglican shrine building in the village itself. 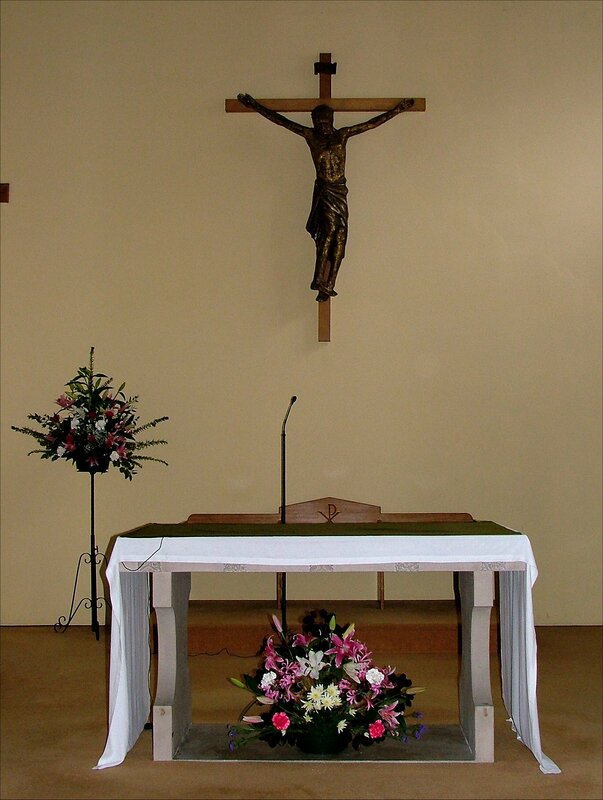 It became imperative for the Catholic church to have a more imposing presence in the area. 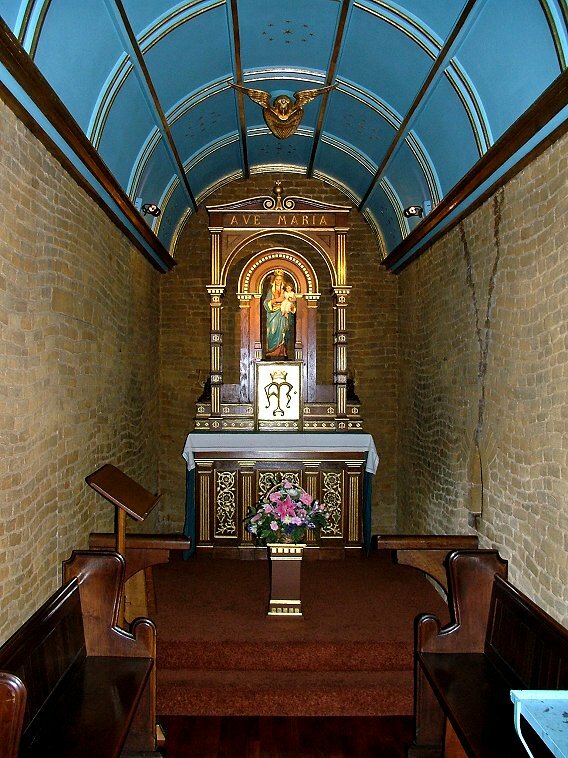 In 1934, the shrine of Our Lady of Walsingham was translated from Kings Lynn to Houghton St Giles. Cardinal Bourne of Westminster led a procession of ten thousand pilgrims from the Church of the Annunciation to the Slipper Chapel, where he declared the building the National Shrine of Our Lady. And so it remains today. 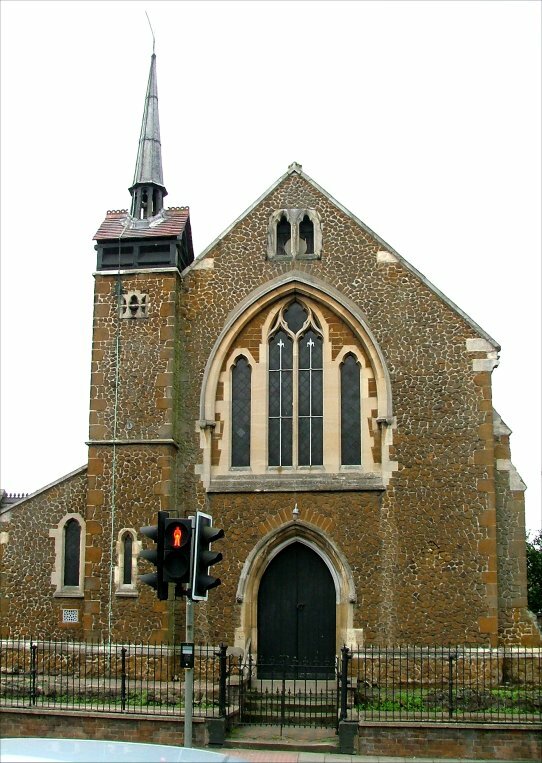 The building was joined in the 1930s by the chapel of the Holy Ghost, and then in the 1980s by the vast, barn-like Church of the Reconciliation, one of the largest modern churches in East Anglia. Curiously, back in 1934, it was decided to leave the original shrine statue of the Virgin and Child at the Church of the Annunciation, and have a new one made to the designs of the medieval original, which is known from the Abbey seal. 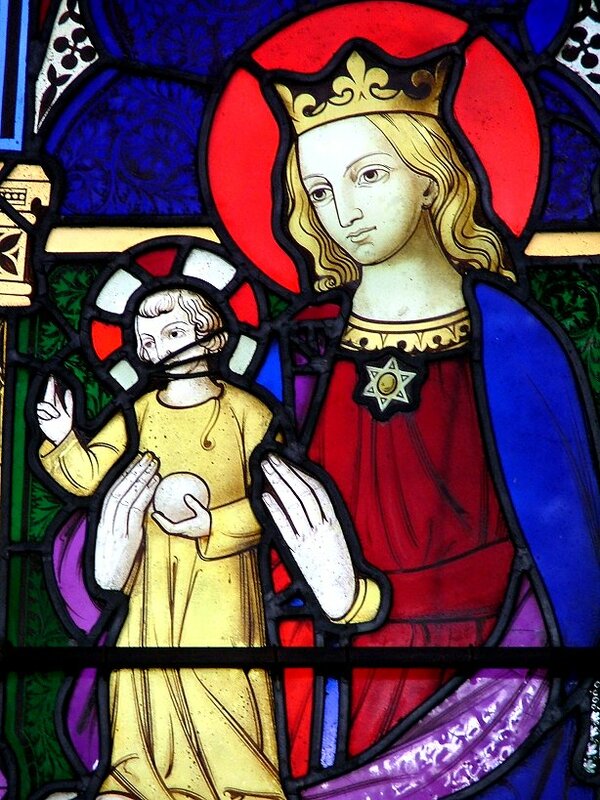 And so, more than a century after she became the focus of fanatic devotion, Mary still sits with her son in the silence of this Kings Lynn suburb. Wrigglesworth's church is today much as he left it, although of course the changes that Vatican II brought have made it a simpler, quieter place. The walls are all in white, punctuated by the lightly coloured stations, also from Oberammagau. There are two interesting relics of the past. 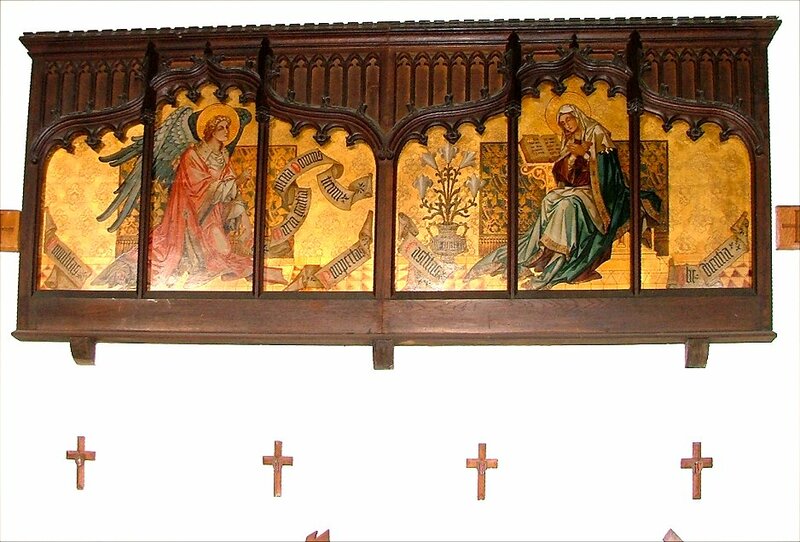 The first is a screen of six panels depicting the Annunciation. 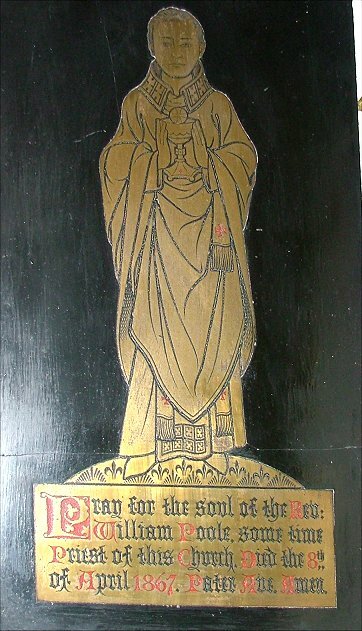 It comes from the reredos of the 1897 church, and it formed the top layer of three, the other two consisting of Saints and Angels. 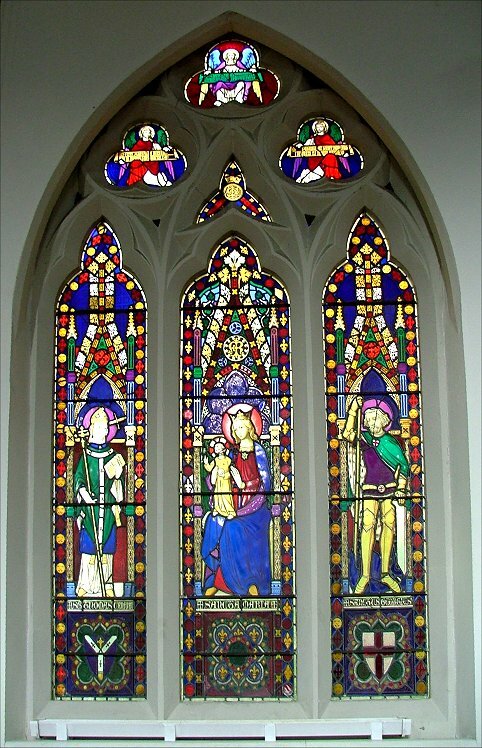 Beside it, and perhaps of greater interest, is glass from the original Pugin church. It is rare early work by the great William Wailes, and features the Annunciation and St George. The chapel is approached through glass doors that deaden all sound once you are inside. The shrine is also simplified; the fifteen lamps have gone. I wonder if they are now in the Walsingham chapel at Norwich Catholic Cathedral? The wooden entrance screen has also gone. Instead, a gorgeous modern window of the Dream of Richeldis shines afternoon light into the narrow space. 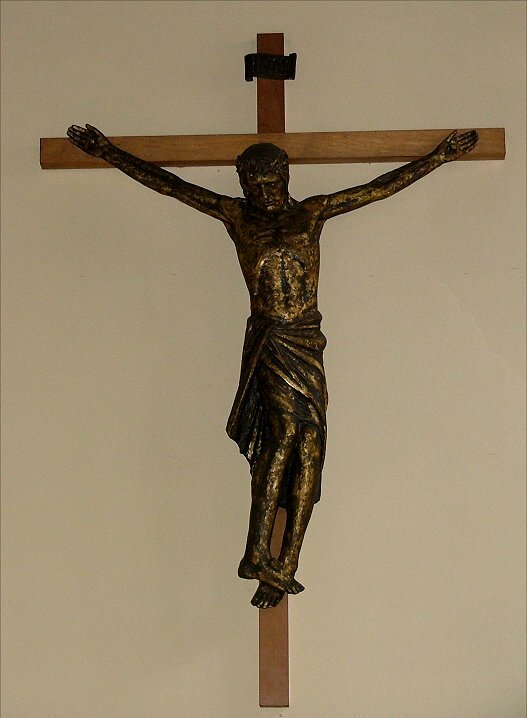 There are two great curiosities, modern brass figures of two of this church's Priests. One is to George Wrigglesworth, and the other to his predecessor, William Poole. Memorials to a glorious past, and silent witnesses to a peaceful present. 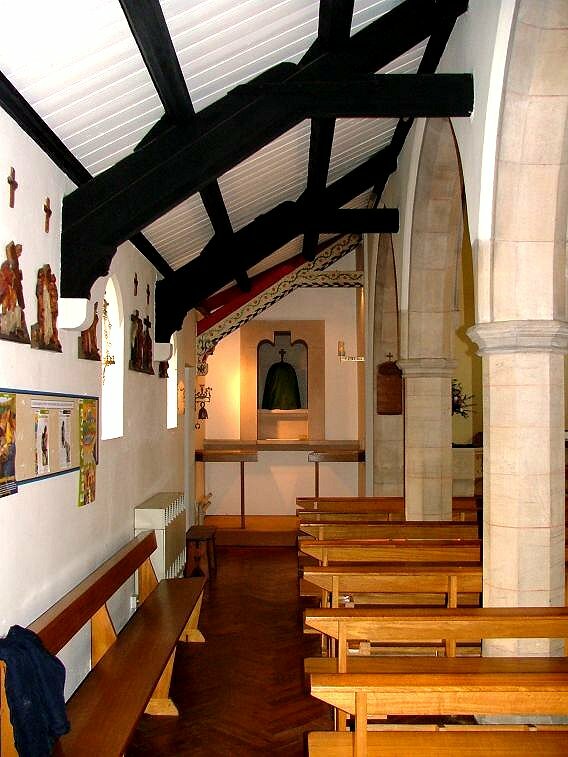 Back in the main part of the church, a fine west gallery has been built in recent years; but this seems a small church for such a busy parish. 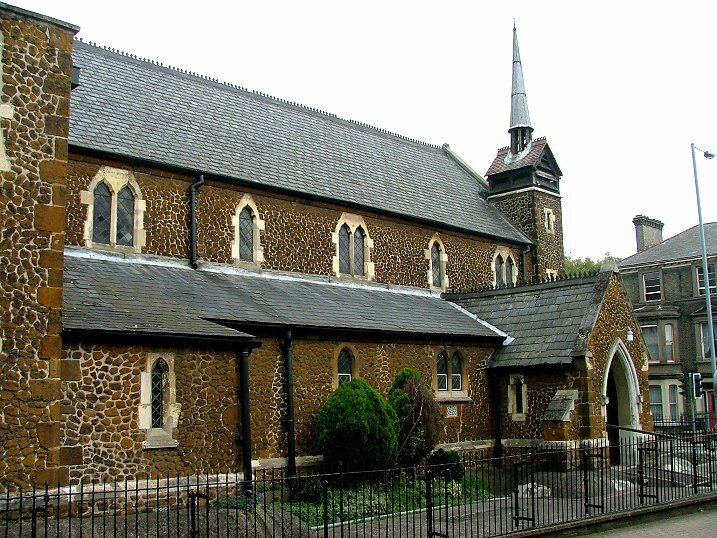 For Midnight Mass and for other special Masses they have sometimes used the redundant medieval town centre church of St Nicholas; and in fact there is now a second, larger Catholic church in Kings Lynn, Holy Family on the Gaywood estate, which was consecrated in 1985. 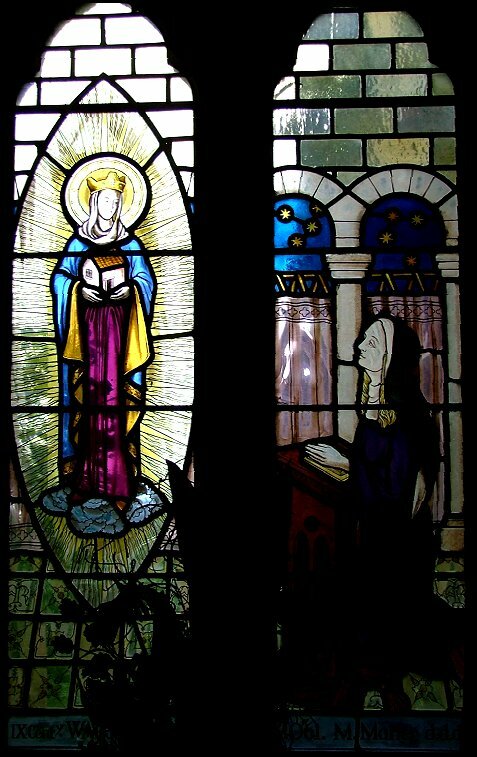 The Church of the Annunciation is a delight to visit, and it is with sadness that I must tell you that it is kept locked, which no Catholic church should be. But Parish Priest Father David Finnegan is a nice man who obviously loves his church - his presbytery is immediately to the east of the building, and he made us very welcome.